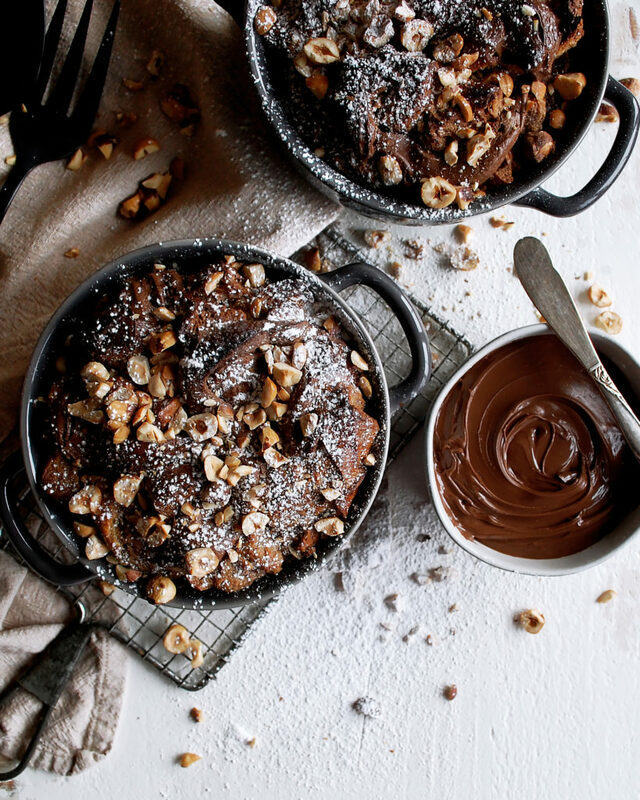 This Nutella Brioche Bread Pudding is the absolute perfect breakfast to wake up to on Christmas morning! Merry Christmas, everyone! I cannot believe the day is finally here. I hope you all have the best time with your family and loved ones. 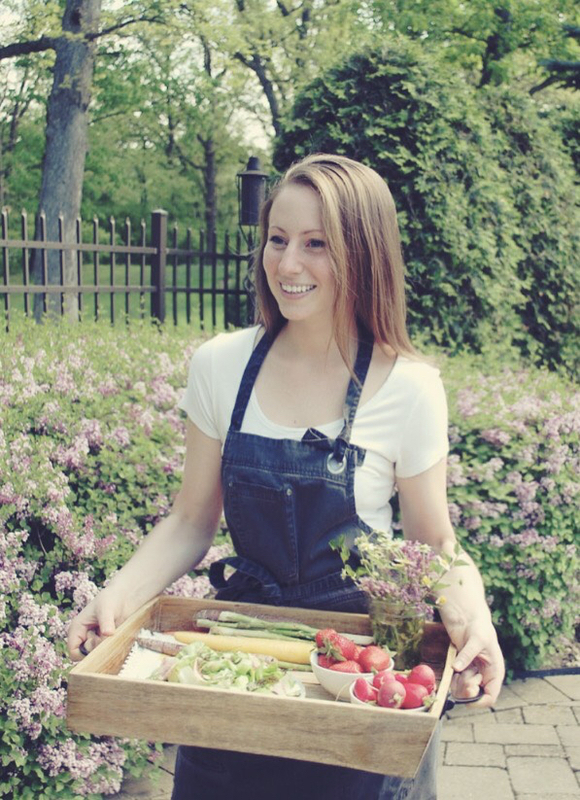 Plus, I hope there is plenty of absolutely delicious food on your tables today! I’m typing away as I wait for my family to get up (we have some pretty late risers in this family). We’ll be opening presents, having more family over, eating cheese and charcuterie platters with a few family favorite appetizers, and then settling in to one of my favorite dinners of the year: my grandma’s lasagna and my dad’s lemon chicken. I cannot wait! There will absolutely be plenty of sweet treats throughout the day and some festive drinks as well! We make a spiced grog every year, which is basically a mixture of cider and fruit juices spiced with cinnamon and brown sugar. YUM. 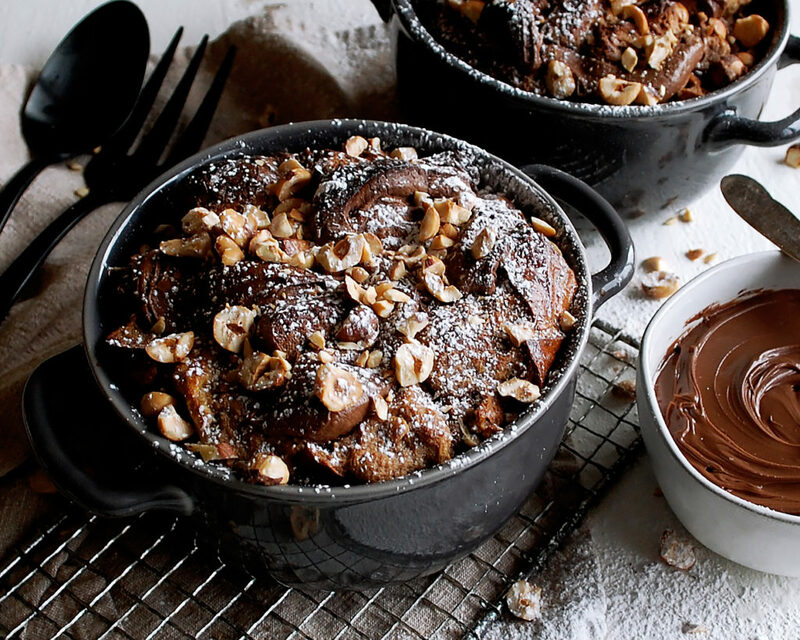 Now, let’s talk Nutella brioche bread pudding. Bread pudding…one of my all-time favorite and family loved recipes. I mean, who doesn’t like sweet, custardy bread baked until golden? 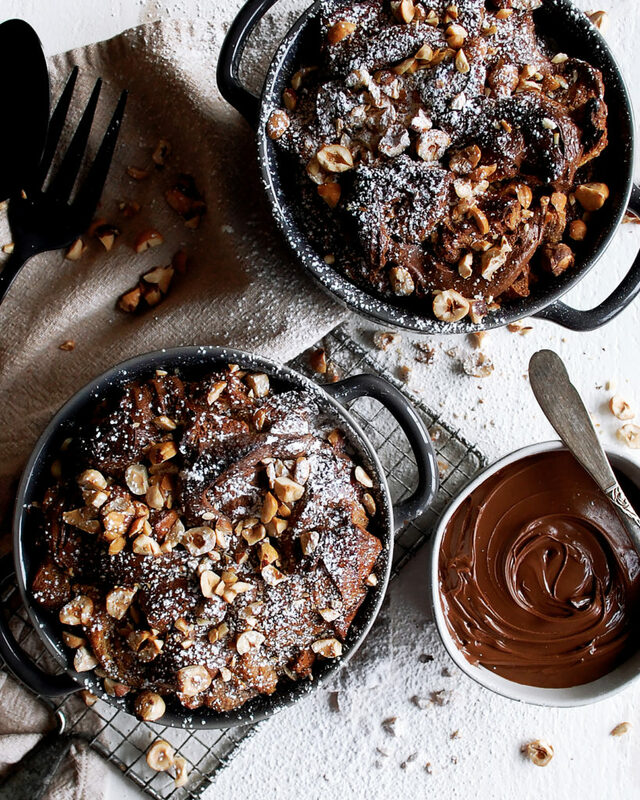 Well, I’ve added Nutella and am using brioche bread, and it turned out to be one of the most delicious dishes I have ever made (I’m probably biased because I love Nutella)! And not going to lie, this is pretty decadent. It’s rich and very sweet. But, for Christmas morning, I couldn’t think of doing things any other way! This recipe is so simple to prepare, and all you need to grab is a few simple ingredients. If you’re like me, you always have some Nutella in your pantry, so there’s one to check off the list. This whole thing comes together really easily. Throw it in the oven while opening presents, and your whole house will be smelling delicious. It’s warm and cozy, and I’m so excited it’s finally snowing because eating this by a fire with the snow coming down just seems all the more perfect. Preheat the oven to 400°F. Spread the hazelnuts onto a baking sheet. Roast the hazelnuts for 5 minutes. While the hazelnuts are still warm, use a towel to rub them in order to peel the skins. Discard the skins. Roughly chop the hazelnuts and set aside. In a large mixing bowl, whisk the eggs. Add the brown sugar and Nutella, whisking until smooth. Gradually add the milk, whisking until incorporated. Stir in the vanilla and salt. Add the brioche bread cubes and half of the chopped hazelnuts to the egg mixture and mix well until the liquid has been absorbed by the bread (it will absorb very quickly). Grease an oven-safe baking dish with butter (I used 2, 6” wide bowls that are 3” high…a regular 9×13” baking dish will work, too). Add the bread mixture to the dish. Top with the remaining hazelnuts. Lower the heat of the oven to 350°F. 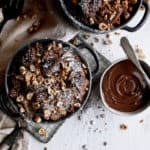 Bake the bread pudding for 40-45 minutes, or until cooked through. 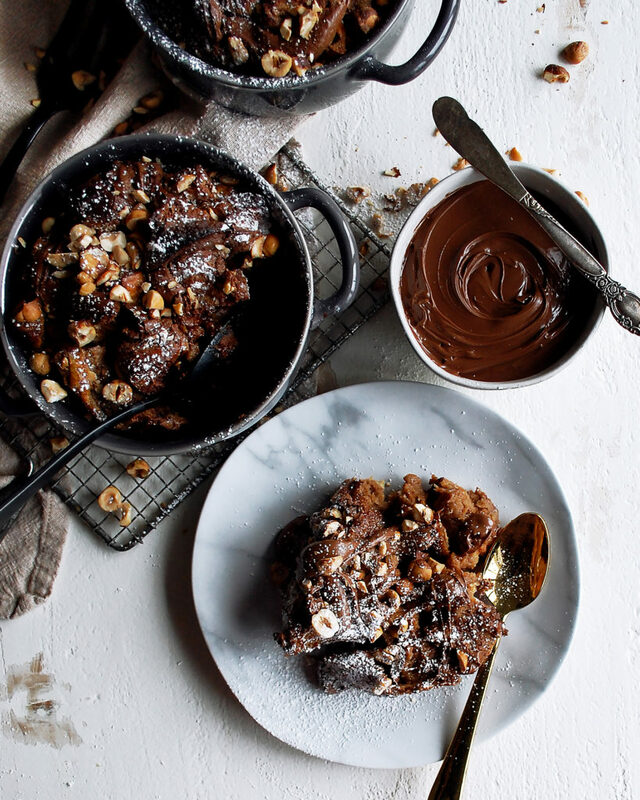 Cover the bread pudding with foil after 30 minutes if it is looking too brown on top. 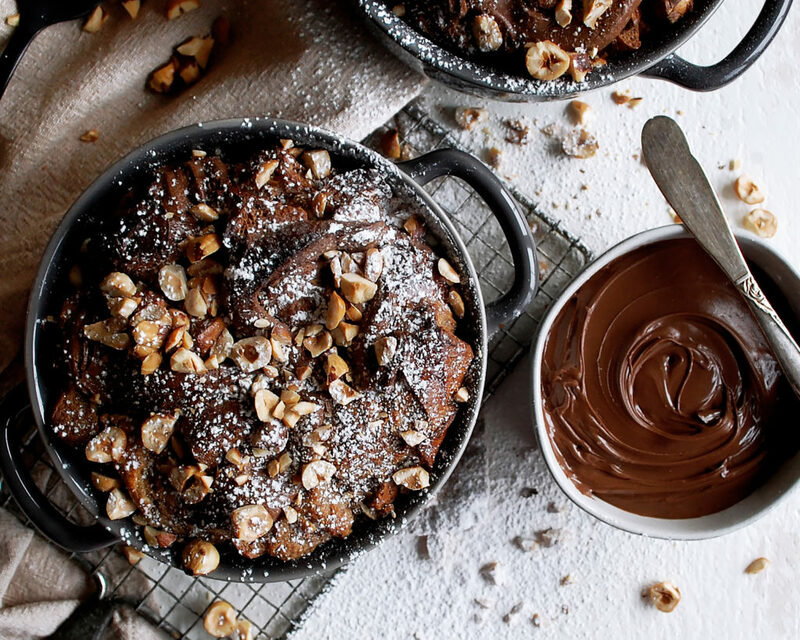 Serve the bread pudding with warm Nutella on the side. Sprinkle powdered sugar over top right before serving. What an amazing creation! Can’t wait to make it myself. Thanks so much! This is truly one of my favorite things ever! !